I went to a training today for my district and throughout the entire training, they were talking about using standards tracking to form differentiated student groupings for instruction. And my little ClassMax heart soared because not only can ClassMax effectively and efficiently track observable standards-based performance in students, but it can also give you a place to organize your students into groupings of all kinds, maximizing your classroom success. 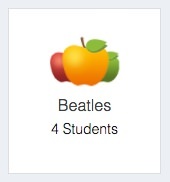 The student grouping feature lives on the class dashboard. When I first created ClassMax, I envisioned this grouping feature with very basic usage because that’s how I was using it in my classroom. I had three groups: Enrichment, Grade-Level, and Low. But the more I have sat and thought about how I can use this feature in my classroom this year, the more ideas I have come up with! Today at my training, I thought about grouping students based on standards performance. Let’s say I give an assessment and I have a handful (okay, maybe TWO hands full…) of kids who bomb the assessment on a particular standard. Wouldn’t it be great to be able to group those kids in ClassMax and then recall their grouping in a single click, whenever or wherever you needed? I’d basically only have to look at the data report once (which is all I can take, really…) and form my ClassMax groups from those results. From then on, anytime I need to see my data results, I simply click the standard group and see who is in it. I could be sitting in a data meeting with my admin and someone might say, “Hmm… I wonder how many of Mrs. Brown’s kids struggled with RL.1.3…” and I could be like, “Oh, it was 8. And their names are….” AND THEY’D ALL BOW DOWN AND THEN GIVE ME A PUPPY. Would I have that data without ClassMax? Of course. ClassMax is just putting it at my fingertips. Then, let’s say later I am working in a small group with that group of kids who scored low in RL.1.3. I could pull that group up on ClassMax and have that open in front of me to record their standards progress on the spot as we work. And since we are all rockstar teachers, let’s now pretend that the entire small group has reached the next level on the standards scale. I can record progress for an entire group in one click, too. CLICK, CLICK, DONE. Another way I plan to use groups in ClassMax is for seating assignments. I use tables in my classroom, so kids work with their table groups every day. Why not have a table group listed? And when the entire table is acting out of control, I can just record their behavior for the entire table in just one click. Or, if they are all working well together and I see them progressing up the standards scale, I can mark that collectively, too. CLICK, CLICK, DONE. You can use groupings to help track your special needs learners, too. I teach primarily low-performing ESE students. Often times, there are at least a handful of my kids who receive push-in or pull-out services through my language arts class. With ClassMax, I can put these students into a group and when they receive their services, I can simply select the entire group and assign them an accommodation usage. Instantly, I have tracked that entire group for their accommodations and it took two clicks. CLICK, CLICK, DONE. Lastly, let’s say I am having my students work on group projects. If I make a ClassMax group for each project group, I can easily track who is working with whom, what their topic is for their project (I named my groups based on their project topic), what level they are on their standards, and if I have assigned any accommodations to the group. I can even use the notes feature to assign comments about the group’s performance to use the next time I am working with them. CLICK, CLICK, DONE. My biggest fear about ClassMax is that people will look at it’s simplicity and think, “Eh.” But the simplicity is by design. The intention of ClassMax is that it can be used to YOUR level of need. You can simply record student data or you can use ClassMax to meet even greater needs. I have spent this entire preplanning week thinking of ways I can make ClassMax work harder for me. What can I do with this tool? And to be honest, there’s not much it CAN’T do because of it’s simplicity. I can really use it however I dream up and I think that’s becoming one of my favorite, unintentional features that we offer. This entry was posted in Accommodations Tracking, Behavior Monitoring, ClassMax, Groupings Feature, Progress Monitoring and tagged ClassMax, teachers.